Replace multiple lines of text in multiple files. Is there a better alternative to EasyReplace? Is EasyReplace really the best app in HTML category? Will EasyReplace work good on macOS 10.13.4? 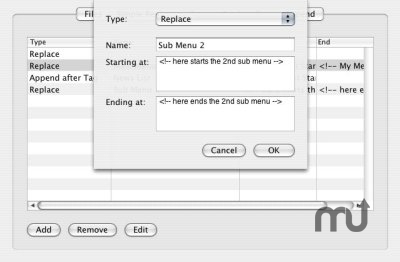 EasyReplace allows you to easily replace multiple lines of text in multiple files. You may either enter the precise text to replace, or tags, allowing EasyReplace to identify the text block to replace. This is especially useful for Web developers who often have to update equal content that can be found on several Web pages (e.g. a menu or header). EasyReplace needs a rating. Be the first to rate this app and get the discussion started! EasyReplace allows you to mark the content to be replaced by arbitrary text marks (e.g. comments in html) and then replace it by a single click in all of your files saving you a lot of time. The next time you have to replace something, just enter the new text and you're done. You can also place tags in a file and append something after/before the tag instead of replacing something.